Most small aircraft are designed with reciprocating engines. The name is derived from the back-and-forth, or reciprocating, movement of the pistons that produces the mechanical energy necessary to accomplish work. The main mechanical components of the spark ignition and the compression ignition engine are essentially the same. 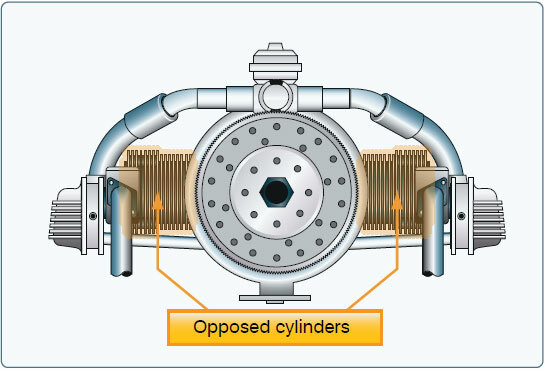 Both use cylindrical combustion chambers and pistons that travel the length of the cylinders to convert linear motion into the rotary motion of the crankshaft. The main difference between spark ignition and compression ignition is the process of igniting the fuel. Spark ignition engines use a spark plug to ignite a pre-mixed fuel-air mixture. (Fuel-air mixture is the ratio of the “weight” of fuel to the “weight” of air in the mixture to be burned.) A compression ignition engine first compresses the air in the cylinder, raising its temperature to a degree necessary for automatic ignition when fuel is injected into the cylinder. Continued improvements in engine design led to the development of the horizontally-opposed engine, which remains the most popular reciprocating engines used on smaller aircraft. These engines always have an even number of cylinders, since a cylinder on one side of the crankcase “opposes” a cylinder on the other side. [Figure 7-2] The majority of these engines are air cooled and usually are mounted in a horizontal position when installed on fixed-wing airplanes. Opposed-type engines have high power-to-weight ratios because they have a comparatively small, lightweight crankcase. In addition, the compact cylinder arrangement reduces the engine’s frontal area and allows a streamlined installation that minimizes aerodynamic drag. Figure 7-2. Horizontally opposed engine. Depending on the engine manufacturer, all of these arrangements can be designed to utilize spark or compression ignition and operate on either a two- or four-stroke cycle. In a two-stroke engine, the conversion of chemical energy into mechanical energy occurs over a two-stroke operating cycle. The intake, compression, power, and exhaust processes occur in only two strokes of the piston rather than the more common four strokes. Because a two-stroke engine has a power stroke upon each revolution of the crankshaft, it typically has higher power-to-weight ratio than a comparable four-stroke engine. Due to the inherent inefficiency and disproportionate emissions of the earliest designs, use of the two-stroke engine has been limited in aviation. Figure 7-3. Two-stroke compression ignition. 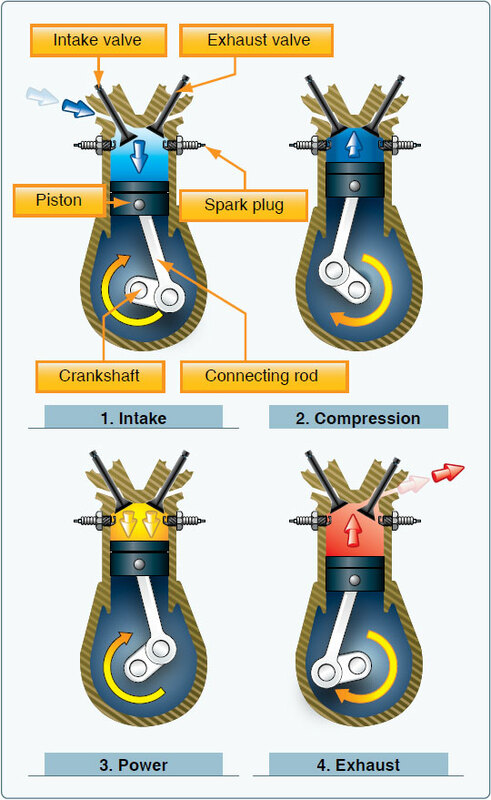 Spark ignition four-stroke engines remain the most common design used in GA today. [Figure 7-4] The main parts of a spark ignition reciprocating engine include the cylinders, crankcase, and accessory housing. The intake/exhaust valves, spark plugs, and pistons are located in the cylinders. The crankshaft and connecting rods are located in the crankcase. The magnetos are normally located on the engine accessory housing. Figure 7-4. 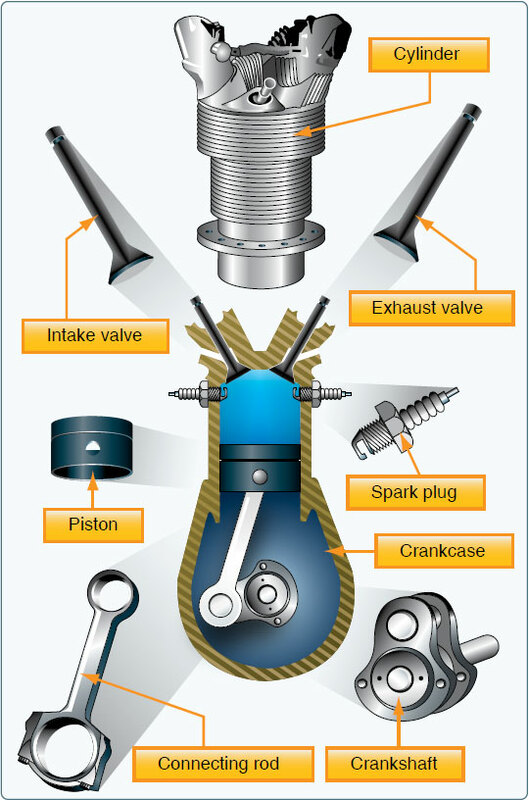 Main components of a spark ignition reciprocating engine. In a four-stroke engine, the conversion of chemical energy into mechanical energy occurs over a four-stroke operating cycle. The intake, compression, power, and exhaust processes occur in four separate strokes of the piston in the following order. The intake stroke begins as the piston starts its downward travel. When this happens, the intake valve opens and the fuel-air mixture is drawn into the cylinder. The compression stroke begins when the intake valve closes, and the piston starts moving back to the top of the cylinder. This phase of the cycle is used to obtain a much greater power output from the fuel-air mixture once it is ignited. 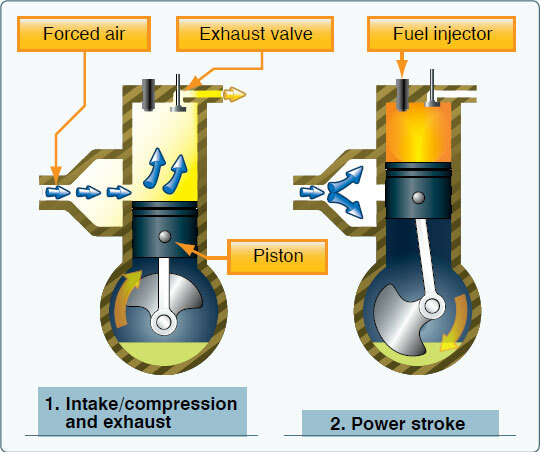 The power stroke begins when the fuel-air mixture is ignited. This causes a tremendous pressure increase in the cylinder and forces the piston downward away from the cylinder head, creating the power that turns the crankshaft. The exhaust stroke is used to purge the cylinder of burned gases. It begins when the exhaust valve opens, and the piston starts to move toward the cylinder head once again. Even when the engine is operated at a fairly low speed, the four-stroke cycle takes place several hundred times each minute. [Figure 7-5] In a four-cylinder engine, each cylinder operates on a different stroke. Continuous rotation of a crankshaft is maintained by the precise timing of the power strokes in each cylinder. Continuous operation of the engine depends on the simultaneous function of auxiliary systems, including the induction, ignition, fuel, oil, cooling, and exhaust systems. Figure 7-5. The arrows in this illustration indicate the direction of motion of the crankshaft and piston during the four-stroke cycle. The latest advance in aircraft reciprocating engines was pioneered in the mid-1960s by Frank Thielert, who looked to the automotive industry for answers on how to integrate diesel technology into an aircraft engine. The advantage of a diesel-fueled reciprocating engine lies in the physical similarity of diesel and kerosene. Aircraft equipped with a diesel piston engine runs on standard aviation fuel kerosene, which provides more independence, higher reliability, lower consumption, and operational cost saving. In 1999, Thielert formed Thielert Aircraft Engines (TAE) to design, develop, certify, and manufacture a brand-new Jet-A-burning diesel cycle engine (also known as jet-fueled piston engine) for the GA industry. By March 2001, the first prototype engine became the first certified diesel engine since World War II. TAE continues to design and develop diesel cycle engines and other engine manufacturers, such as Société de Motorisations Aéronautiques (SMA), now offer jet-fueled piston engines as well. TAE engines can be found on the Diamond DA40 single and the DA42 Twin Star; the first diesel engine to be part of the type certificate of a new original equipment manufacturer (OEM) aircraft. 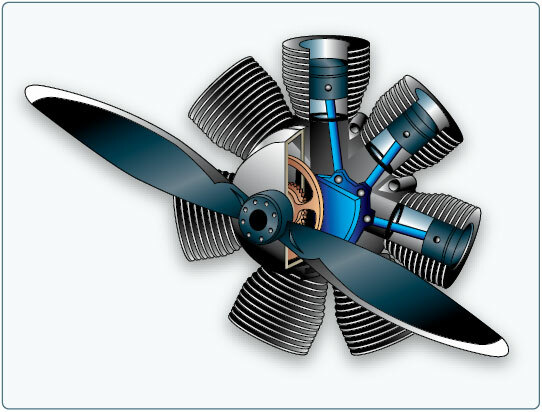 These engines have also gained a toehold in the retrofit market with a supplemental type certificate (STC) to reengine the Cessna 172 models and the Piper PA-28 family. The jet-fueled piston engine’s technology has continued to progress and a full authority digital engine control (FADEC, discussed more fully later in the chapter) is standard on such equipped aircraft, which minimizes complication of engine control. By 2007, various jet-fueled piston aircraft had logged well over 600,000 hours of service.